The Mystery Road DVD is the complete first season. 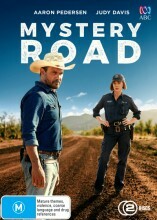 The Mystery Road season 1 DVD stars Detective Jay Swan who is assigned to investigate the mysterious disappearance of two young farm hands on an outback cattle station. One is a local Indigenous footy hero, and the other a backpacker. Working with local cop Emma James, Jay's investigation uncovers a past injustice that threatens the fabric of the whole community. Stars Colin Friels, Aaron Pedersen, Deborah Mailman and Judy Davis. Click the button below to add the Mystery Road - Complete Season 1 to your wish list.